Tropical weather, sandy beaches galore and friendly faces greet you in Hawaii – a place known as much for its luxury holidays as its bountiful and astounding natural wonders. There’s a rich history to delve into here, which sets the context for the state’s thriving culture and local identity. Situated in the North Pacific, way off the west coast of the mainland USA, this archipelago of eight volcanic islands joined the United States in 1959, making it the most recent addition of all the 50 states. Confusingly, one of the islands is actually called the Island of Hawaii, but the capital of the state, Honolulu, is on Oahu. Still with us? Good. Take your pick of the beaches in Honolulu – but there's a reason why so many people flock to Hanauma Bay. Combining a beach, marine life conservation area, underwater park and marine education centre, it has shallow reefs with unique Hawaiian fish species. The narrow spit of beach is glorious – no wonder it was voted the best beach in the US in 2016. But what this location is really about is the snorkelling. Lying at the base of a volcanic crater, the bay’s rocks are full of colourful aquatic creatures, which thrive in this bountiful habitat. It’s mesmerising to watch as you float on by. Just bear in mind that the bay is closed on Tuesdays to allow the fish to feed in peace. Explore Hawaii’s natural and cultural history – with a smattering of science – at the must-visit Bernice Pauahi Bishop Museum. It boasts the largest collection of Polynesian artefacts in the world, giving a fascinating insight into Polynesian culture, while the natural world is represented by a staggering 24 million specimens. Open since 1889, there’s plenty for kids here, with a science adventure centre, loads of interactive exhibits, a planetarium and fascinating educational programs. Exhibitions change frequently, so you’re as likely to find out about dinosaurs as you are about the history of Polynesian voyagers. The breathtaking Diamond Head State Monument is a 300,000-year-old crater with a spectacular hiking trail around its perimeter. The climb to the 760-foot summit is tough, involving two long sets of steps, and even a 225-foot tunnel, but at the top you’re rewarded with panoramic views of Honolulu and across the rest of Oahu. It’s because of these views – which on a good day include neighbouring islands – that the crater was used as a military facility in the early 20th century, and you can still see evidence today of its previous life. 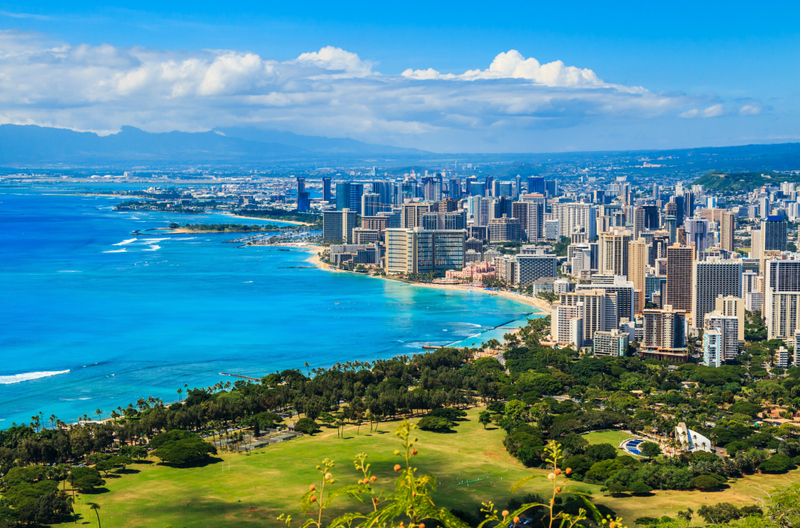 These highlights are just a snippet of what Hawaii and Honolulu have to offer. There’s also Pearl Harbor, which has a visitor centre documenting the WWII attack, as well as other fascinating towns and cities, restaurants serving local specialities and, of course, miles of golden beaches. Whether you choose to relax or explore, one of the best ways to see the island of Oahu is with car hire in Hawaii – giving you the freedom to do everything at your own pace and start making memories that will last forever.